The word quatre-feuille (or quarter-foil) represents a kind of ornamentation which has four lobes or foils. Twenty years ago, when I was in architectural school, I had a bit of an argument with the teacher who taught baroque and gothic architectural history. Needless to say, those styles have remained strongly in my mind than any other, because of the event. 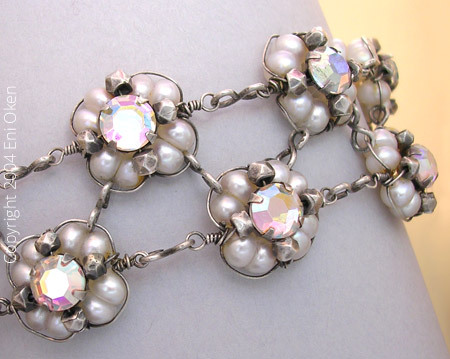 This ornamented bracelet is made of a net of quarter-foil links -- the pearls of each link feel soft against your skin. Each link measures 1/2 inch diameter and is made with sterling silver wire, silver beads, pearls and a single rhinestone rose-montee. 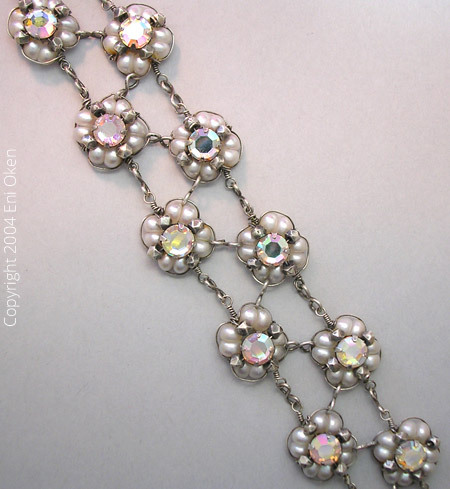 At first, I wanted to create something inspired on medieval chain-maille but a bit more luxurious and ornamental. Instead of using simple rings to form the net I opted for flower-shaped quarter-foils.